One of our Vacuum State readers turned up at Bucky Group session today. This is the first time I am meeting him and I am delighted he is joining us for this Sunday's session. Whilst we walked, I related to him how I had started the blog with just a 'good feeling' not knowing exactly where it would lead to; but as it went on, it got clearer that I want to share my spiritual journey with everyone and that how seemingly mundane events are full of inspiration for us everyday. However, care has to be taken that everyone's journey is different and we all take on different paths. So, do not take my posts for its empirical values, but rather as illustrations of how one can be mindful in our daily life. 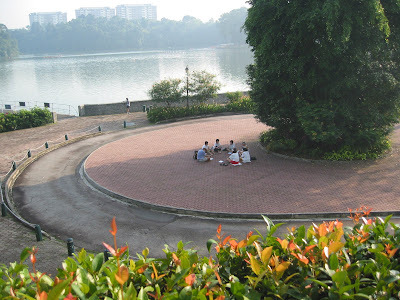 As I was still recovering from my knee injury due to the intensive packing and moving in November, I decided not to risk it by jogging, but instead walked along the banks of MacRitchie reservoir while discussing about the blog with my reader-friend. We read about the parallelogram of forces in "Utopia or Oblivion" and how Gallileo's theory of the resultant forces of two colliding vectors does not apply in marine navigation, which he learned in class. 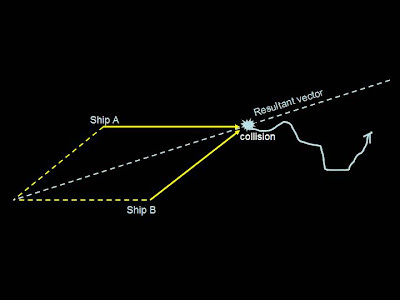 Here is the illustration of two ships about to collide and what their resultant vector (in grey) will be in theory. 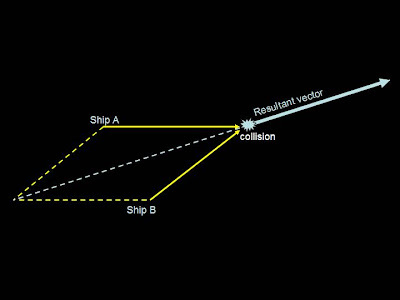 At collision, both ships did not move to the resultant vector (direction and speed). One of them gone towards the centre of the earth (sink), while the other went wobbly, as illustrated in the curly arrow. Why? Footnote: Bucky didn't use the word 'sink', because, to 'sink' is ambiguous. Sink from where? Sink from what? However, 'gone towards the centre of the earth' is specific. Similarly, Bucky suggests that we do not use the word 'sunrise' and 'sunset', as the sun does not rise or set from earth. Neither is there 'up' or 'down', but rather 'in' and 'out' (of the earth) respectively. Joo Hock commented that Bucky would rather have us not understand what he says than to misunderstand what he says. That is why he is so specific and each of his sentence is so rich and dense in content. For more details, click here. One way of understanding Bucky's books better is to join the Bucky Group. I found it easier to understand "Critical Path" (another of Bucky's classic) after joining Bucky Group discussions. The collided ships did not take the pre-calculated resultant direction and speed because the calculations assumed that the sea is two-dimensional, that the sea is calm and that the ships are weightless. In other words, it is an abstract thinking removed from reality. That is why one of the ships sunk (oops! I mean gone towards the centre of the earth) and the other went wobbly! In "The Age of Fallibility", the author George Soros said that we think in concrete terms where there is always a 'thing' to which a name corresponds and we can use the name and the thing interchangeably: thinking and reality are co-existence. Only if we think in abstract terms do we begin giving names to things which do not exist independently of our naming them. So these 'things' (that was created in the mind) exists through our labeling them. This is where thinking and reality becomes separated. Joo Hock then brought the Bucky's example of "stretching a string with both hands" - this statement itself is an abstraction. We have an idea of what he is doing, but do not know what kind of string in reality. It involves generalisation. The next generalisation is that in unity, there is duality. As the pair of hands pulls the string outwards (tension), the material of the string pulls inwards (compression) to keep itself in one piece. So tensive forces co-exists with compressive forces. It is duality in unity. In a concave surface, there is the convex surface behind. How about the spiritual Light? It is said that there is no duality in Light, as Darkness does not exist. Darkness is not the opposite of Light, but the absence of Light. Joo Hock replied that yes, there is no duality in Light, but then we can understand the Light through Darkness. There is a function of Darkness. Referring to the skies above us, there are stars, but we can't see them because there is daylight. When darkness falls, then we can see the light. Also, in photography, shadows complement light to give the beauty of the picture. For instance, sand dunes would not be attractive at all without shadows. Religions scorn at Darkness, but Darkness has its purpose. If we can only see the Light, we wouldn't understand our divine self. During breakfast, I learned about crystal healing and dousing from my Vacuum State reader-friend. I use crystals in Reiki healing and with crystal pendulum. I was told that to use the pendulum to answer questions, our minds have to be still (neutral) without attachments. Otherwise it wouldn't work. We also have to program the crystal and allow time for us to attune with the crystal. But then, I was thinking, if I am really still, I usually know the answers to my questions anyway, and would not need to ask the crystal. Actually, we are not asking the crystal per se, but we somehow read our subconscious through the crystal. Perhaps a point of focus. Next, we should explore and exploit what is available in Cyberspace. Youtube has lots of useful videos. Some blogs have very useful content too. This is what Alvin Toffler said about the new wealth that is created by volunteer contributors that are not paid any money. I like to elaborate on dowsing for the benefit of those who may want to know a bit more. Dowsing is one of the most ancient arts or sciences known to man and was used by the ancient Egyptians, Hebrews and Chinese. They were avid users of dowsing rods and pendulums. During those times, it was an invaluable tool for locating minerals and metals in the earth. However, its usage has expanded many-fold today. Although dowsing is quite widely used today, yet not many people fully understand it. Dowsing is also called “Intuition Technology, meaning you put your conscious/thinking mind in a state of sincerity and concentration to open a “communication channel,” and then ask a carefully worded question. All it does is enable you to get information from the intuitive side of your brain – the right side of the brain. This is done with a tool called a pendulum (usually a crystal or heavy object suspended from a string) that allows you to access and connect with your higher power, so you can make the highest and best decisions for yourself and others in all aspects of life. Sometimes it is also called divination because the source of the answers comes from the universal consciousness. We can dowse for many things, for example, finding out about one’s state of health, in areas of healing, relationships, and even businesses. Thank you for sharing your knowledge and experience about dowsing with us. Selling Fear 5 - "BE CAREFUL!!!!"